All images courtesy of Jim Hipple. Click to enlarge. Thanks to Jim Hipple for the pics. Click to enlarge. Jim's photos are the best. I always look forward to them. I wish he'd gone to the Florida game! Man, those black shirts sure looked a hell of a lot better than I thought they would. 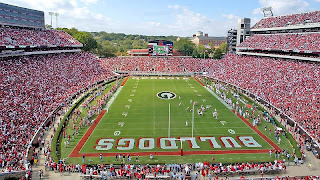 In Red, White, or Black.....Go Dawgs!!!! It may just be me, but if you enlarge the third picture from the bottom, with Knowshon in the foreground, it looks like Tray Blackmon and Quentin Groves are hugging each other and staring in fear at a counter-dancing boogeyman.